Satellite images show that both the Northwest Passage and the Northern Sea Route off Russia’s northern coast are free of ice for only the second time since 2008, when both were seen open for maritime navigation for the first time since satellite measurements were introduced nearly 30 years ago, according to a PhysOrg report. 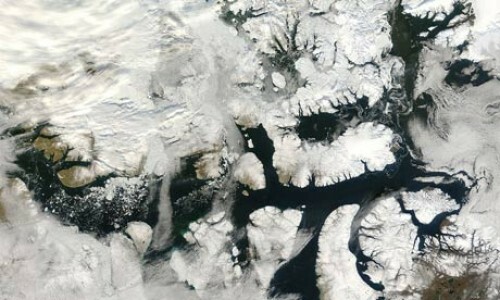 “The minimum ice extent is still three to four weeks away, and a lot depends on the weather conditions over the Arctic during those weeks,” Leif Toudal Pedersen, a senior scientist at the Danish Meteorological Institute, was quoted as saying. Providing a shortcut for shipping between Europe and Asia, Northwest Arctic sea ice cover hit a record low in 2007 and the previously unnavigable Northwest Passage opened up for the first time since scientists began measuring Arctic sea ice cover using satellite measurements.In addition to marking what’s increasingly looking like a major turning point with regard to climate change and global warming, the simultaneous opening of the Russia’s Northern Sea Route and the Northwest Passage off the Canadian Arctic is being closely monitored by governments around the polar region, and oil, gas and mineral exploration and production companies eager to gain access to the region’s potential mineral wealth. The US National Oceanic & Atmospheric Association (NOAA), Shell Exploration & Production, ConocoPhillips and Statoil USA E&P signed an agreement on August 23 which calls for collaboration on ocean, coastal and climate science for the Arctic. “This agreement provides a framework among the signatories to share high-quality data to enhance NOAA’s ability to monitor climate change and provide useful products and services that inform responsible energy exploration activities in the region,” according to the press release. On August 4, the US Dept. of Interior granted Shell conditional approval for its plan to drill four exploratory oil and gas wells in the Beaufort Sea off Alaska’s North Slope next summer. Shell has spent some $4 billion and more than five years lobbying for approval, according to this NY Times report. The oil and gas companies have agreed to share data that NOAA will make public, including data on meteorology, coastal and ocean currents, circulation and waves; sea ice studies, biological science and hydrographic services and mapping. “Despite the wealth of scientific research conducted on the Arctic environment to date, much remains unknown, and no single government agency or entity has the resources or capacity to meet the task alone,” said Jane Lubchenco, Ph.D., Under Secretary of Commerce for Oceans and Atmosphere and NOAA administrator.